Explanation: Not once, but twice the International Space Station transits the Sun on consecutive orbits of planet Earth in this video frame composite. The scene was captured on August 22 from a single well-chosen location in Schmalenbeck, Germany where the ISS created intersecting shadow paths only around 7 kilometres wide. Crossing the solar disk in a second or less, the transits themselves were separated in time by about 90 minutes, corresponding to the space station's orbital period. 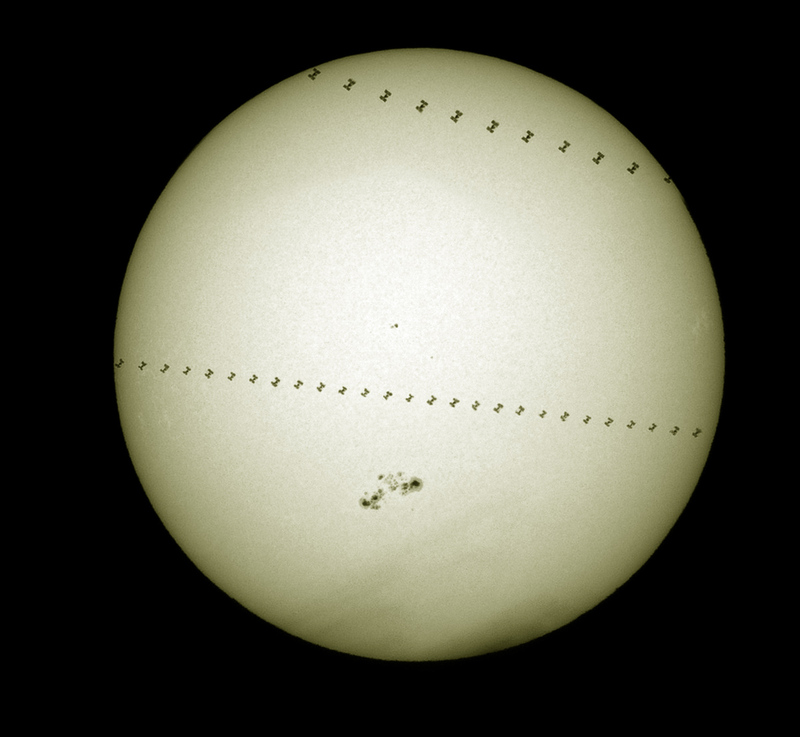 While the large, flare-producing sunspot group below centre, AR 2043, remained a comfortable 150 million kilometres away, the distance between camera and orbiting station was 656 kilometres for its first (upper) transit and 915 kilometres for the second more central transit. In sharp silhouette the ISS is noticeably larger in angular size during the closer, first pass. Of course, tomorrow the Moon will transit the Sun. But even at well-chosen locations, its dark, central shadow just misses the Earth's surface creating a partial solar eclipse.